New Delhi: A meeting former Bombay high court chief justice Manjula Chellur held with the late judge B.H. Loya’s son, Anuj Loya, on November 28 last year came in for criticism in the Supreme Court, with counsel for the petitioner, Bombay Lawyers’ Association, suggesting her conduct amounted to serious impropriety. The meeting took place just a week prior to Chellur’s retirement. The bench, presided by Chief Justice of India Dipak Misra, Justice A.M. Khanwilkar and Justice D.Y. Chandrachud, heard Dave on Monday making a strong case for directing an independent inquiry into Loya’s 2014 death. In a statement released to the press after meeting Justice Chellur, Anuj Loya said that he did not doubt any foul play in his father’s death, and therefore, did not want an enquiry. Calling Justice Chellur’s conduct “unashamedly orchestrated”, Dave said it is a blot on democracy and the judiciary that judges after judges were willing to issue statements to avoid an enquiry into Loya’s death. Earlier, Dave also questioned the conduct of two judges of the Bombay high court, Justice Bhushan Gavai and Justice Sunil Shukre, in giving interviews to the Indian Express, on November 27, 2017, stating that there was nothing about the circumstances of Loya’s death to raise any suspicion. 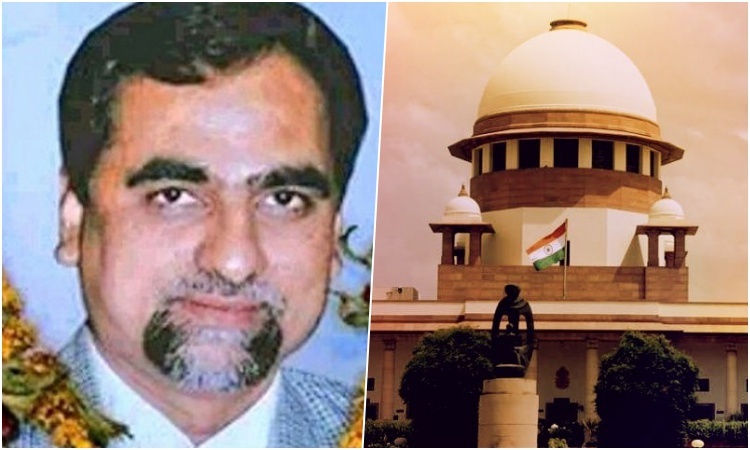 Both the judges had gone to the Meditrina Hospital, Nagpur, when Loya was taken there, and where he was declared dead on arrival in the early hours of December 1, 2014. Dave asked whether the two judges took permission from the CJ or the CJI to speak to the media. Referring to the Restatement of Values, adopted by the entire judiciary, he claimed that one of the points urges judges not to go to the press. “Why are you shy of an independent investigation?” he asked those two judges. The criticism of the conduct of the two judges of the high court provoked the senior counsel representing the state of Maharashtra, Harish Salve, Mukul Rohatgi and additional solicitor general Tushar Mehta to spring to their defence, saying that allegations against sitting judges are not permissible. Dave countered the argument, saying that had Mehta appeared for Bharatiya Janata Party president Amit Shah for 15 years, and was now briefing Salve and Rohatgi, and that it was a sad commentary on the state of affairs prevailing. “Your lordships should stop Tushar Mehta from appearing in this matter,” Dave told the bench, which largely remained lukewarm to the wrangling between the counsel. When Salve objected to this, Dave said that Salve, as a responsible member of the bar, should be protesting against this. Dave then referred to the recent change in roster at the Bombay high court which resulted in the review application against discharge of the accused in the Sohrabuddin encounter case being shifted from Justice Revati Mohite-Dere to Justice N.W. Sambre. To this, Justice Chandrachud pointed out that the high court has to make periodic changes in the roster on the administrative side, taking into consideration various aspects, concerning judges and their families, and that any shift may not have anything to do with the manner of how a particular case is being handled by a judge. Justice Chandrachud disclosed that whenever he had to change the roster as the chief justice of the high court, he had followed the norm that there would be no part-heard matters (before the judge who was being changed). “We are conscious of this tradition; therefore, with every change in roster, you can’t infer that (something is amiss),” he said. When Dave alleged that the entire judicial service is at the beck and call of one man, Justice Khanwilkar intervened and asked him not to make such a broad statement. Referring to the Bombay high court administrative committee 2014 decision to transfer the judge hearing the Sohrabuddin case despite the Supreme Court’s clear directions not to do so, Dave said the CBI judge J.T. Utpat was transferred because he had pulled up Amit Shah for his absence during the hearing. Utpat’s transfer order came, when the CBI court was expected to pass an order on the discharge application filed by Shah. Utpat was later succeeded by Loya. Dave said if the executive had violated the Supreme Court’s orders, it would have been issued a contempt notice. “The entire trial stands vitiated, because of this decision,” Dave said. When the CJI said the bench is not concerned with this, Dave asked the bench to order an investigation, even if it does not entertain any suspicion, because members of Loya’s family have no reason to lie and what they said runs counter to the official report. Was Loya pressurised, as the family claims, he asked, and added that there are fundamental grounds for investigation. Dave then referred to Anuj Loya’s letter, written in 2015, wherein he claimed that Mohit Shah, who was chief justice of the Bombay high court at the time, had visited the family two and a half months after his father’s death and couldn’t even look him in the eye. “If we are harmed, Chief Justice Mohit Shah alone is responsible,” Anuj Loya had written. Dave reminded the bench that the Supreme Court had ordered far-reaching investigation in cases brought to light through investigative journalism. “Investigative journalism must be respected in this democracy,” he said. “What interest (does) the Loya’s family have in damning the then chief justice, Shah?”, he asked. “The width of your lordship’s jurisdiction is very wide. Tension between executive and the judiciary is a must for healthy democracy. We need to test it all the time,” he told the bench. Further arguments will continue at 2 pm on March 8.